We are garden fairies and we are taking a break from our cavorting during the Crocus Carnival to provide an update on what is really going on here at May Dreams Gardens. First of all, as garden fairies, we believe in fair, honest reporting so we feel an obligation and duty, a sacred trust with our readers (greetings to the both of you!) 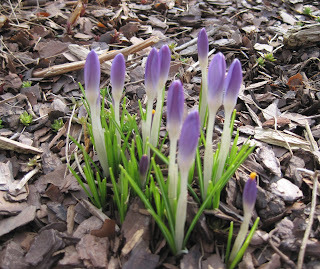 to inform you that the picture of the crocus is from last year. There are most certainly crocuses just like those blooming this year but we could not convince or cajole or trick Carol into taking any pictures of them, even though the weather has been quite nice these last few days. We almost convinced her to take pictures yesterday but she was cutting down the big tall switchgrass by the utility boxes in front and said "later". Of course, later it was dark, so "no go" on the picture. Frankly, we are garden fairies and we were shocked when Carol came out and did even that much gardening, if cutting back switchgrass can be elevated to the level that one would call it "gardening". Anyway, let's assume that cutting back switchgrass is gardening, for the sake of continuing this story, otherwise, it will go on and on and we garden fairies like to get right to the point because otherwise, good readers like the two of you lose interest and get lost and - hey, is someone trying to trick us and get us to lose our place in the story? Anyway, the story is that we have been concerned for some time that Carol will get lost in some rabbit hole, which is what we call those old gardening books of hers, and miss the gardening windows of opportunity, the gardening WOO's, that present themselves from time to time during the last days of winter, which should be used for tasks such as cutting back switchgrass. However, rumors of winter giving it up for this year are, of course, premature, and we garden fairies could have told you that. There is still more ice and snow in the forecast, which means that instead of writing this blog post for readers (can we name the both of you? ), we should be carrying forth with the Crocus Carnival. However, lest you think we are lazy fairies who do nothing but look for reasons to celebrate, let us remind you that we garden fairies are responsible for closing up crocuses whenever it rains or clouds up, or snows or ices up. Yes, we are in charge of the pollen and we take our responsibilities quite seriously. With all the changes in weather, we are busier in the garden these days than Carol is! That needs to change, one day soon, or we aren't... garden fairies. Really? You have crocus blooming there? We are still covered in snow. No crocus in sight. Not even snowdrops yet. I have crocuses and were a little shocked that they closed up...I have never grown them before I didn't understand the closing thing...kind of like moss roses? I wish I could grow these. They just say spring! Thanks for sharing yours. I am so glad that there is someone there who knows how important their job is. I also didn't realize that closing up the crocuses was a part of your huge extended job description. I really think though, that trying to motivate Carol must be the hardest part of your job. 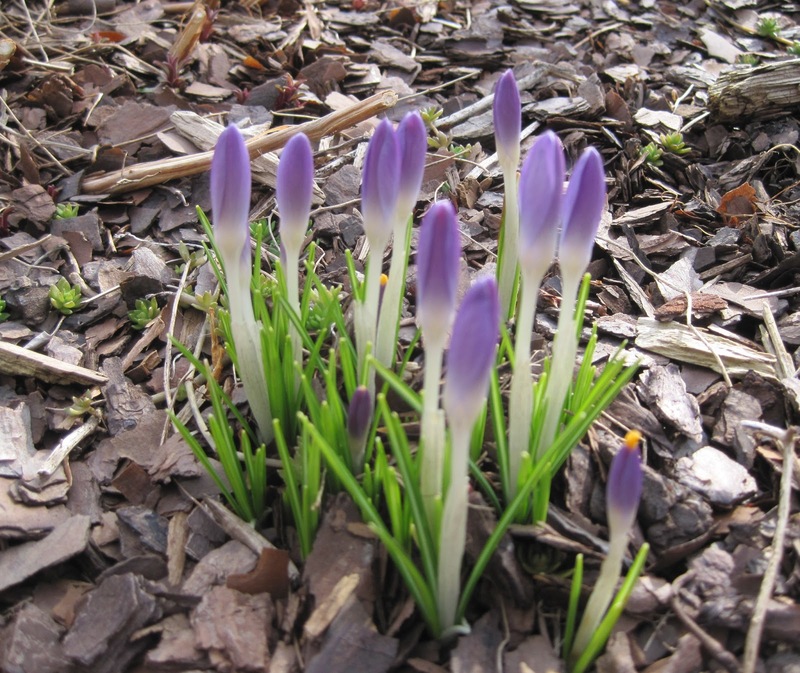 Maybe you could inspire a whole slew of crocus to bloom? - that would surely get her attention! Responsible, serious garden fairies. Good to have them on your side! It is good to know that Garden Fairies are taking good care of the crocus in the garden. I was worried about that. I want there to be pollen for the bees should they awaken during one of these warmer days. I must thank the garden fairies for their care of my Tommies! I have some garden fairies and some gnomes, but mine must be lazy because they don't do any gardening. They just like to play tricks on me when I'm working in the garden!